Welcome to our 2015, 2016, 2017, and 2018 Holiday and Christmas Inflatables. Bookmark this page, and check back often as we will be updating this page and adding every week some of the newest and hottest Christmas Inflatable Outdoor Decorations. And don't forget to share with your friends your favorite inflatables on Facebook, Google Plus, Pinterest, and on your other favorite social sites. Explore below the joy and wonder of Outdoor Christmas Inflatables. New Gemmy designed Christmas Inflatable for.... Kaleidoscope Greeen Christmas Tree. This inflatable comes with a internal KALEIDOSCOPE spot light fixture that shines on the inflatable to make a night time glowing effect. 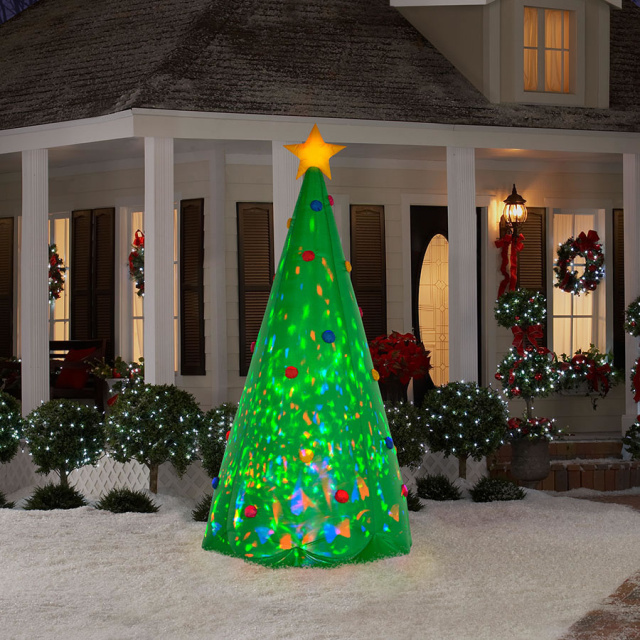 This Christmas Tree inflatable has a beautiful and brilliant green color that will grab the attention of all passerby and put all in the Holiday spirit. This large 8 foot Christmas inflatable is topped with a gold star. Large 9 foot Fuzzy Bear Soldier. This Nut Cracker style Fuzzy Bear will have a lot of onlookers and fans this Christmas season. This 9 foot tall dapper dressed toy soldier bear will be the hit of the neighborhood and will generate lots ooohs and ahhhs! New for The Holidays 2017...8 Foot Row of Presents. Let this colorful and very attractive row of 6 presents greet all your visitors this Holiday Season. Lights up for a night time glow. New Holiday Christmas Inflatable for 2017....Airblown Penguins in Sweaters. Brighten up the Holiday Season with these joyful looking penguins donned in their Noel Sweaters. These adorable 4 penguins will surely add some Holiday cheer in these colorful sweaters that spell out NOEL This inflatable extends out 6 feet long. Great Christmas Inflatable for all you Soccer Players Very adorable Christmas Scene with Santa playing soccer with his good trusted Penguin friend. Looks like Northpole sports will never be the same. This heartwarming Holiday inflatable stands 5 feet high. From the Disney Frozen Movie....It's Olaf the Snowman Christmas Inflatable. Children who loved Frozen will definitely enjoy this Gemmy Character Christmas Airblown. Olaf stands 3.5 feet tall and made of the new tinsel fabric. And this snowman lights up for a night time glow. Set of 3 Elegant Holiday Red Gift Boxes with Green Bow Ties. This Christmas decoration set is UL listed and furnished with 60 lights. For indoor or outdoor use. Batman Holiday Inflatable. Batman is ready for the Holidays as he wishes everyone with his banner Seasons Greetings. All you Batman fans, don't miss out on this 3.5 foot Batman Holiday Inflatable. Grab one today! New Gemmy Disney Olaf Christmas Inflatable. Olaf has found himself enjoying some R&R in his new hammock between two palm trees. This fun Holiday Inflatable extends out 7.5 feet long. Ninja Turtle Raphael Holding Holiday Banner. Mutant Ninja Turtle Raphael is decked out in his Santa hat and is ready to greet all your guests and neighborhood visitors with a large Holiday greeting. Licensed Nickelodeon Holiday Inflatable. Great for indoor or outdoor use. 3.5 Feet Tall inflatable. Elegant looking Nutcracker Soldier Christmas Blowup. You can almost here the Nutcracker theme song with the dapper looking Traditional Nutcraker Soldier. Add some Nostalgia to your Holiday decorating this year with this colorful 6.5 foot Christmas Airblown. Santa has a new helicopter for named the Gingerbread Helicopter. Get ready to take off with Santa with his Gingerbread friend. Mr Gingerbread Man is at the controls as the propellers are turning. Hope they have a good defroster with all the ice on the helicopter. This large Airblown Gemmy Inflatable extends out 8 feet. There is a new T-Rex in town for Christmas 2018. Be the talk of your neighborhood this Christmas 2018 with this Giant Green T-Rex Christmas Inflatable. Everyone will enjoy this inflatable each night as this giant Air Character Airblown T-Rex in his Santa Hat and gift in mouth will light up your yard. This Christmas Yard Inflatable stands 7 feet tall. 7 Foot Photorealistic Santa with Green Sack of Presents Christmas Inflatable. Easy way to supersize your Christmas decorating with this 7 Foot Inflatable....and to greet and wow all your guests and neighbors with a big Christmas Greeting! Self inflates in seconds and lights up. Snowman with Birdhouse Christmas Airblown Yard Decoration. Unique and eye catching Holiday Inflatable that can be a center piece in your yard decorations or could fit into as separate piece into your Holiday theme yard decorating. Attractive cardinal on the birdhouse adds that extra special Holiday touch. This inflatable stands almost 5 feet tall. 71" Animated Reindeer Christmas Inflatable. This very adorable reindeer will be the hit in your neighborhood this Christmas Season. Almost 6 feet tall, the head of the reindeer rotates back and forth. The expression on this reindeer face will bring forth lots of ooohs and aawwws this Holiday Season! This Christmas Arirblown Inflatable with make a great addition to your Holiday Yard Decorations. This 6 foot Air Character Inflatable will create Holiday Cheer to your visitors and neighbors. This 3 Set Noel Candle Ariblown lights up to create a night time illumination. Heartwarming new inflatable that will be the buzz of neighborhood this Holiday Season. This Disney Minnie and Mickey Christmas scene with the two roasting marshmallows over a warm campfire glow with melt the hearts of visitors and neighbors alike. This Disney inflatable extends out 6 feet long. Very adorable new Holiday Inflatable...Penguins and Snowman Cookie Jar Christmas Scene. Looks like our Penguin friends got caught in the cookie jar and are enjoying some sweet Holiday treats and fun. This inflatable features the animated penguin popping in and out of the cooker jar. This Large Heartwarming Holiday inflatable stands 6.5 feet tall. Fun Animated Christmas Carolers Featuring African American Santa, Snowman, and Reindeer. This 6 foot Christmas inflatables features our Gospel Trio holding music sheets, and they light up and move in motion to beloved Gospel tunes. Ring in the Holiday Season to merriment and Gospel music! 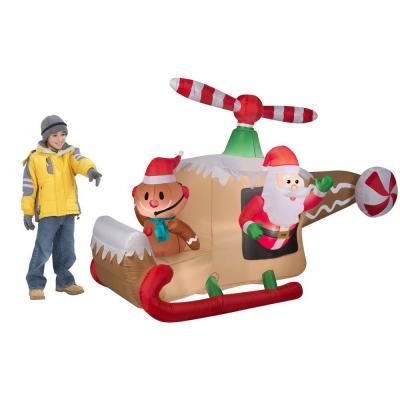 This Friendly 7 foot Santa Inflatable will present a Christmas scene both for indoors or outdoors. Great Santa inflatable to greet all your guest and neighbors. Supersize your Christmas decorating in your yard this year with this very large Santa Inflatable. This 12 Foot Tall Gemmy Airblown Inflatable makes for a great centerpiece. This Airblown features Santa wishing a big Hello with candy cane and gift. New Frosty the Snowman with Gift Holiday Inflatable. Brighten up your Holiday Season with an old faithful friend....Frosty The Snowman. Frosty has a big Smile and stands 42 inches tall and is ready to greet all your neighbors this Holiday Season! Fun New KALEIDOSCOPE 2018 Christmas Inflatable. Igloo with 2 Penguins Christmas Inflatable. Looks like our Penguin friends want to be in the circus with their acrobatic show. The penguins stand on top of the igloo and the kaleidoscope light moves with swirling motion. All to create some cool night time Holiday effects.Stands about 8 feet tall. Beautiful new Nativity Scene Inflatable. Elegant looking traditional Nativity featuring Mary, Joseph, donkey and sheep, and the baby Jesus. Remember the reason for the season in 2018. This Nativity extends out 5.5 feet. New Airblown Dog Christmas Inflatable....This handsome dog decked out in his Santa hat and green scarf wants to celebrate Christmas with you this year. This great economically price inflatable is a great one for all you dog lovers out there. This Holiday inflatable stands 3.5 feet tall. Wonderful inflatable for all you Disney Minnie and Mickie fans. This darling Minnie with Christmas Holly will grab the attention of many onlookers. And for all your festivities, what a wonderful item to use to greet all your guests with this 3.5 foot Minnie Christmas Airblown. And children will definitely admire this adorable inflatable. Calling on Disney Mickey Fans...This 2016 Mickey wants to greet all your guest and visitors this Christmas Season. This handsome looking Mickey Christmas Inflatable stands 3.5 feet tall and decked out in Holiday colors. Children and adults will love this Disney Inflatable! Colorful and Merry Christmas Tree Inflatable. Brighten up the yard this Holiday Season with the great looking decorated Christmas tree inflatable. Can be a great center piece for your Outdoor Christmas Yard Decorations. Inflatable stands 6.6 feet tall. Gemmy Snowman Inflatable Pathway Markers. Three Adorable Snowman extending out 8 Feet Long. Light up your Holiday Season with these 3 Adorable Snowman ready to play some Holiday Cheer as they greet your visitors and neighbors. Head over to our Christmas Outddoor Lawn Decorations page for an expanded selection of our 2018 Christmas Inflatables.